Of course I’m going to Machu Picchu, even perhaps do The Inca Trail. That’s the plan, sort of. But if you’ve followed me a bit on my round the world trip, you’d have found that my travel plans are as solid as the wind. So I was ignorantly surprised to find that I needed to book the Inca Trail about 4 months ahead. But then again, maybe I’m not really too keen to walk for 4 days on a hard winding trail. I’m actually really conflicted on this. On one end, I’d really want to do it for the historical value, but then again, I always die of physical exertions. Finally I arrived to Peru. I realized that while I know of Machu Picchu and the Inca Trail, I really don’t know anything about it. So what is Machu Picchu? 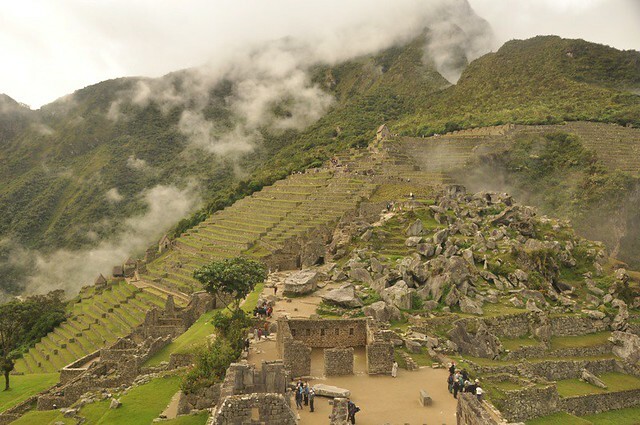 Here’s a quick introduction to Machu Picchu, the Inca Trail, and the Incas. The Incas arrived to the Andes from Lake Titicaca and established their capital in Cusco in the early 1200s. Since then have conquered more territories from the north and south of Cusco forming the most organized empire in South America. The territory stretched from Quito, Ecuador, their northern capital, to the mountain regions of Peru, Bolivia, north of Chile, and north-east of Argentina. But the astounding empire lasted only about 100 years, ended by the arrival of the Spanish in 1532. The ancient citadel straddles the saddle of a high mountain with steep terraced slopes falling away to the fast flowing Urubamba river snaking its hairpin course far below in the valley floor. 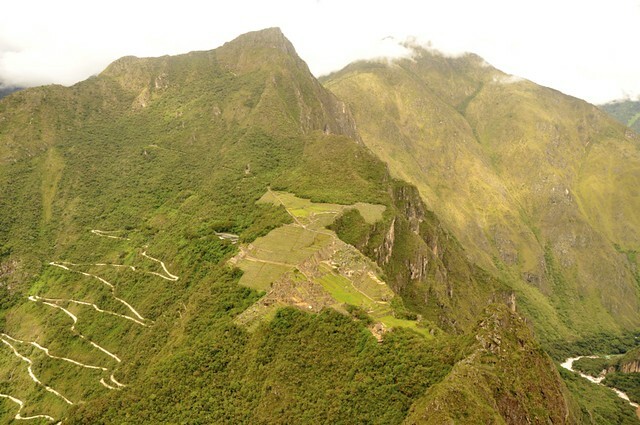 Towering overhead is Wayna Picchu, and green jungle peaks provide the backdrop for the whole majestic scene. Machu Picchu is a complete Inca city. For centuries it was buried in jungle until Hiram Bingham stumbled upon it in 1911. However, there were families living there at the time of his arrival who helped him explore the lost city, making historians declare them as the true discoverer of Machu Picchu. The ruins, staircases, terraces, temples, palaces, towers, fountains and the famous Intihuantana (Post of the Sun) requires a whole day. We were there for 10 hours. Take time not only to appreciate the mansard, but also the selection of large rocks for foundation, and the water channels. The most impressive way to reach Machu Picchu is via the centuries old Inca Trail that winds its way from the Sacred Valley (near Ollantaytambo), taking 3 to 5 days. The spectacular hike runs from KM 88, Qorihuayrachina (2,299m) a point immediately after the first tunnel 22km beyond Ollantaytambo station. A sturdy suspension bridge has now been built over the Rio Urubamba. Guide tours often start at KM 82, Piscacucho, reached by the road. What makes this hike so special is the stunning combination of Inca ruins, unforgettable views, magnificent mountains, exotic vegetation, and extraordinary variety. the lost city. on my list too..
such a great place to visit. Yes, it is on my bucket list! I chanced upon your website only yesterday! And, as if the universe was trying to tell me something, this is your latest entry. It has been one of my dreams to go to Peru– specifically, Cusco. Your writings and photos are incredible. Kudos and safe travels! It’s soooo amazing, right? The altitude almost killed me, but it was worth it. Gorgeous shots! Wow, i feel so envious! This is one of my most coveted trips, so i really envy your opportunities. I have been reading and looking at photos about Macchu Picchu but yours certainly gave some new ones. That shot of the zig-zag trail is amazing! I hope you will post more photos and articles of your experiences. Thanks for the visit Andrea. I am thankful everyday for having the opportunity to travel like this.